Cement Remover is a highly effective Cement Remover and surface renovator. 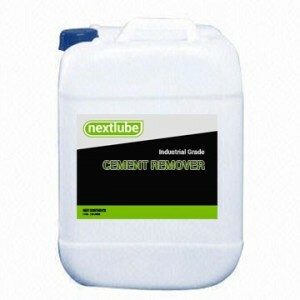 Its strong penetrating action removes cement from metal surfaces. Cement Remover is especially useful for renovating metal equipment, machinery, tank, metal sheet or where cement deposits must be removed. Deep penetrating action – cement remover penetrates rapidly to cut through cement and rust without pre-cleaning. Economical – Cement Remover highly effective formulation saves labor costs. High concentration allows for dilution up to two times with water for dip tank application. BRUSH-ON, or DIP TANK METHOD is recommended. For light cement coating Cement Remover can be diluted up to two parts of water. Brush on surface, let soak until the cement softens then scrape to remove all residues.